2000 Brown & Sharpe “Gage-2000” CMM Machine s/n 0500-1784 w/ Renishaw MIP Probe Head, 22” x 29 ½” x 3” Granite Plate, Brown & Sharpe Micro Measure III Software. Gage Master “Finite Twenty” 12” Optical Comparator w/ Gage Master DRO, Surface and Profile Illumination, 4” x 14 ½” Table. Brown & Sharpe Digi-Hite Plus 24” Digital Height Gage. Starrett 0-6” OD Mic Set. Mitutoyo 14”-15”, 13”-14”, 12”-13” OD Mics. Starrett 24” x 36” x 6” Laboratory Grade “AA” Granite Surface Plate w/ Roll Stand. Starrett Crystal Pink 24” x 36” x 6” Granite Surface Plate w/ Roll Stand. Tru-Stone 18” x 18” x 4.5” Laboratory Grade “AA” Granite Surface Plate. 2007 Kaeser SM10 10Hp Rotary Air Compressor s/n 1312 w/ Sigma Controls. Kaeser SM-11 10Hp Rotary Air Compressor. 2009 Kaeser TBH 13 Refrigerated Air Dryer. Sweco mdl. FM-1.2C 24” Tub Style Media Tumbler s/n 1FM-182-32F. AirFlow Systems Portable Industrial Air Cleaner. 21” Custom Motorized Rotary Table. Nikken 8” 3-Jaw Rotary Index Chuck. Tool Boxes, Hand and Power Tools. 2007 Haas VF-3D CNC Vertical Machining Center s/n 1060675 w/ Haas Controls, 20-Station ATC, CAT-40 Taper Spindle, 20Hp Vector Dual Drive, 7500 RPM, 1000 IPM, 18” x 48” Table, Coolant. 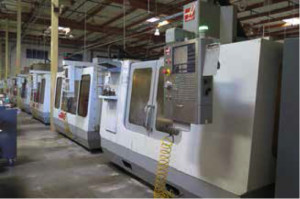 1995 Hass VF-3 CNC Vertical Machining Center s/n 5906 w/ Haas Controls, 20-Station ATC, CAT-40 Taper Spindle, 7500 RPM, 15Hp High Torque Spindle, 18” x48” Table, Coolant. 1994 Haas VF-3 CNC Vertical Machining Center s/n 3600 w/ Haas Controls, 20-Station ATC, CAT-40 Taper Spindle, 7500 RPM, Programmable Coolant Nozzle, 18” x48” Table, Coolant. 1994 Haas VF-3 CNC Vertical Machining Center s/n 3140 w/ Haas Controls, 20-Station ATC, CAT-40 Taper Spindle, 7500 RPM, Programmable Coolant Nozzle, 18” x 48” Table, Coolant. 1994 Haas VF-3 CNC Vertical Machining Center s/n 2697 w/ Haas Controls, 20-Station ATC, CAT-40 Taper Spindle, 7500 RPM, 18” x 48” Table, Coolant. 1993 Haas VF-3 CNC Vertical Machining Center s/n 2604 w/ Haas Controls, 20-Station ATC, CAT-40 Taper Spindle, 7500 RPM, 18” x 48” Table, Coolant. 1995 Haas VF-1 CNC Vertical Machining Center s/n 5317 w/ Haas Controls, 20-Station ATC, CAT-40 Taper Spindle, 7500 RPM, 14” x 26” Table, Coolant. Acra mdl. AM-3VAC 2-Axis CNC Vertical Mill s/n 990217 w/ Anilam 3200 MK CNC Controls, 0-5000 Dial Controlled RPM, Box Ways, 10” x 58” Table. Machinists Corp / ProtoTrak “Dynapower” 2-Axis CNC Vertical Mill s/n 3004 w/ ProtoTrak MX2 Controls, 10” x 48” Table. Falcon Chevalier FCL-2460 CNC Lathe w/ Anilam 1200 T-Plus Controls, Tailstock, Tool Post Grinder, Coolant. LeBlond Regal 15” x 32” Lathe w/ 45-1800 Servo-Shift RPM, Inch Threading, Tailstock, Dumore Tool Post Grinder, 8” 3-Jaw Chuck. Bridgeport Series 1 – 2Hp Vertical Mill w/ Mitutoyo DRO, 60-4200 Dial Change RPM, Chrome Ways, Power Feed, 9” x 48” Table. (2) 2003 Supertec mdl. G20P-45M 10” x 17” Automatic Cylindrical Grinders w/ Supertec Controls, Motorized Work Head, Tailstock, 14” Wheel Cap., Coolant. Landis 12” x 36” Automatic Cylindrical Grinder s/n 460-17 w/ Auto Feeds, Motorized Work Head with 10” 3-Jaw Chuck, 14” Diamond Grinding Wheel, Coolant. Covel Cylindrical Grinder s/n 32-344 w/ Motorized Work Head with 7 ½” 3-Jaw Chuck, Coolant. Blanchard No. 11 Rotary Surface Grinder s/n 9397 w/ Mitutoyo DRO, 20” Electromagnetic Chuck, 11” Grinding Wheel, Coolant. Yamazen / MAX-O KGS-500AH 18” x 59” Automatic Hydraulic Surface Grinder s/n 800139 w/ Electromagnetic Chuck, 14” Wheel Cap., Wheel Dresser, Coolant. Kent KGS-410AHD 16” x 40” Automatic Hydraulic Surface Grinder s/n 830306-2 w/ Electromagnetic Chuck, Wheel Dresser, Coolant. Abawerk Type FFU 750/50 16” x 30” Automatic Surface Grinder s/n 5257 w/ Electromagnetic Chuck, Wheel Dresser, Coolant. (2) Falcon Chevalier FGS-1628AD 16” x 28” Automatic Surface Grinders s/n’s G283A001, G2833001 w/ Chevalier Controls, Electromagnetic Chuck, Coolant. Okamoto ACC-124N 12” x 24” Automatic Surface Grinder s/n 7276 w/ Okamoto Controls, Fine-Line Electromagnetic Chuck, Coolant. Falcon Chevalier FSG-3A1224H 12” x 24” Automatic Surface Grinder s/n P3864006 w/ Chevalier Controls, Electromagnetic Chuck, Coolant. 1999 Acer “Supra-618” 6” x 18” Surface Grinder s/n 99090846 w/ Magnetic Chuck. Acer mdl. AGS-618 6” x 18” Surface Grinder w/ Magnetic Chuck, Coolant. K.O.Lee Tool and Cutter Grinder w/ Motorized 5C Grinding Fixture.